코메디언 이면서 마술사인 Wally Eastwood 가 출연하는 Folies Bergere 쑈 가 공연 되고 있다. 오후 10시 공연은 성인 버전으로 진행된다. 공연 시간은 1시간 30분 정도 이며, 등급은 (C+) 이다. 입장료는 좌석에 따라 $51.45 ( 테이블) / $62.45 ( Booth ) 이다. (C+) The city's longest-running show opened in 1959 and is now one of the last souvenirs of old Vegas and its Parisian-styled showgirls. The current "greatest hits" edition has segments added in the '90s colliding with those preserved in mothballs. There's a quaint elegance to some of it, but the overall effort could use a shot of attitude. (1/21/01 M.W.) 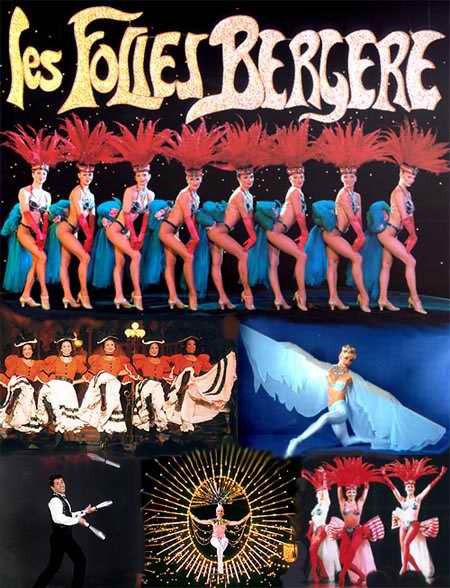 "Folies Bergere" will be presented at 7:30 and 10 p.m. daily, except Thursdays, in the Tiffany Theatre at the Tropicana. The 7:30 p.m. show is for all audiences. No one under the age of 16 will be admitted to the late show. $51.45-$62.45. 3801 Las Vegas Blvd. South. 739-2411.